Alkan Air has been providing charter service throughout the Yukon since 1977. The company has now added professional pilot training to its list of transport and logistic solutions. The flight instructing team has flown many different types of aircraft with collective flight instructing time exceeding 5,000 hours and total flight experience over 10,000 hours. Whitehorse is an excellent place to learn to fly. It offers unique experiences and challenges that are not found elsewhere in Canada. Students not only experience flying at an international airport with traffic including large airliners, but also fly to gravel strips in more remote areas of the territory. Alkan Air flight training is also partnered with Yukon College to offer a two-year Aviation Management diploma program. Glacier Air | Squamish Municipal Airport, B.C. Located in the beautiful and challenging British Columbia coastal mountain range, Glacier Air describes itself as a mountain flying adventure company with a long history of pioneering the mountain flying experience along the Sea-to-Sky corridor from Vancouver to Whistler. Glacier Air’s location and facilities provide an exceptional training environment. Their instructors are also active charter pilots, so they are very familiar with “real world” flying outside the training environment. The school offers a wide variety of specialty flight training including aerobatics and mountain flying to understand winds, density altitude, rapidly changing weather and other outside factors to be considered when flying around rugged peaks. Equipment: Cessna 172, Cessna 206, Bell 206 JetRanger. Okanagan Mountain Helicopters | Kelowna, B.C. Okanagan Mountain Helicopters started as a helicopter flight training school in 2003. The company has grown to serve many clients in the energy, agriculture and forestry sectors, as well as continuing to train helicopter pilots from launching their careers to advanced training and recurrent skills review. Okanagan Mountain Helicopters tailors its course to meet the needs and demands of commercial helicopter companies in Canada, with a focus on developing the best possible flying skills and airmanship, and an introduction to the various types of operational flying that a pilot might encounter. The training facility at Kelowna International Airport – the 10th busiest in Canada – introduces students to fully controlled radio procedures, multiple training locations for confined areas and mountain flying introduction within a control zone, and the best blend of controlled and uncontrolled practice areas. Equipment: Primary training aircraft are Robinson R22 and Robinson R44 helicopters. Optional training is available on a Bell 206 JetRanger. Pacific Flying Club | Boundary Bay, B.C. The Pacific Flying Club (PFC) was formed in 1965 as the Canadian Pacific Airlines Employees Flying Club. It remains one of the premier flight training and general aviation centres in Western Canada. PFC’s instructors, engineers and administrative staff are committed to ensuring students receive the highest level of customer service and instruction possible. The club is a not-for-profit organization and is continuously upgrading facilities and equipment. It is accredited by the Private Career Training Institutions Agency of British Columbia, and was the first training centre in Vancouver to hold this distinction. Students train at Boundary Bay Airport, one of the busiest general aviation airports in Canada. PFC is also partnered with the British Columbia Institute of Technology (BCIT), and together offers the diploma course, Airline & Flight Operations. Equipment: PFC’s fleet of 27 aircraft includes Cessna 152s, 172s and Piper Seneca multi-engine airplanes. The club also offers the most simulator options of any school in the province. Southern Interior Flight Centre | Kelowna, B.C. Southern Interior Flight Centre’s (SIFC) training courses are delivered by industry-experienced instructors who not only ensure students learn the basics, but are also flying in the “real world” of aviation. Located at Kelowna International Airport in the heart of the Okanagan Valley, students spend time flying in mountain valleys, visiting the Rocky Mountains, travelling out over the Canadian prairies and exploring the coast of British Columbia running along the Pacific Ocean. SIFC’s programs help to steer training towards the needs of both the pilot and the industry. Many of the courses are supplied or augmented by aviation companies, employers and industry pilots. Kelowna International Airport is busy enough to challenge students and let them become used to a controlled airport with many different operations and aircraft, but quiet enough to prevent training delays. SIFC recently signed a new deal with Jazz Aviation LP that could spell more career opportunities for pilots graduating from Okanagan College’s Commercial Aviation diploma program. The Jazz Aviation Pathways Program (APP) serves as a fast track for the OC pilots to land flying careers with the national airline. Equipment: Cessna 152, 172s and a Beechcraft Duchess BE-76 multi-engine aircraft. Absolute Aviation | Wetaskiwin Regional Airport, Alta. Absolute Aviation is a flight training and aircraft maintenance facility, largely serving students from Edmonton and central Alberta. The school offers flexible schedules to accommodate various student lifestyles. Ground school can be taken in regular weekly scheduled classes, through an accelerated pace on weekends and even online. Absolute operates out of Wetaskiwin, Alta., with close proximity and access to major airports such as Edmonton International. The school operates in both uncontrolled and controlled airspace, eliminating costly ferrying time to training areas. Equipment: five Cessna 172Ms, one Piper Twin Comanche and one Piper Aerostar. Calgary Flight Training Centre | Olds-Disdury Airport, Alta. The Calgary Flight Training Centre (CFTC) is inside hangar 15 of the Olds-Disdury Airport, between the cities of Calgary and Red Deer. The school provides training for professional pilots and enthusiasts alike. Olds-Disdury Airport is uncontrolled airspace. There is no waiting for air traffic controllers to clear students’ take-offs and landings. Students are also able to start up the aircraft, taxi directly to the runway and take-off when safe to do so. West central Alberta is a great location to learn to fly for a number of reasons, including flat lands for training, mountains to gain mountain experience and close proximity to Calgary International Airport, Canada’s fourth busiest. Equipment: A fleet of Diamond DA20 Eclipse aircraft, a DA40 XLS and Piper PA-30 Twin Comanche multi-engine trainers. The company also offers simulator training. Mitchinson Flying Service| Saskatoon, Sask. Since 1946, the Mitchinson Flight Centre has been one of Saskatchewan’s leading flight training schools, and has a long history of guiding pilots to their desired careers in aviation. The school is located in its own hangar at the Saskatoon John G. Diefenbaker International Airport. Students learning to fly with Mitchinson train in an ATC controlled environment, providing experience for flying in larger centres, but without the traffic delays and congestion of a larger airport. Professional airline pilots who have trained at the school and know what it takes to get ahead in today’s competitive aviation industry own Mitchinson. The ground school classroom is comfortable and equipped with the latest technologies, including SMART board and Apple TV. For students who need greater flexibility, Mitchinson offers ground school DVDs. Mitchinson’s fleet of 13 aircraft are equipped with modern Garmin avionics. Equipment: Cessna 152s, 172s, 182s, a 185 floatplane, two Cessna 182s and two Cessna 310 multi-engine aircraft. The company also offers simulator training. Winnipeg Aviation | St. Andrews Airport, Man. Winnipeg Aviation has been a leading trainer of pilots for more than 20 years. The school’s base at St. Andrews Airport, 15 kilometres outside of the Manitoba capital, offers three runways to maximize training with and without cross winds. The airport has a student-friendly control tower to give learners the valuable experience needed to work and communicate within a busy air traffic control system. Instructors take students into Winnipeg International Airport to get first-hand experience to mix it up with the big players, while also flying to small short, uncontrolled grass strips to learn procedures. Brampton Flight Centre | Brampton/Caledon, Ont. The Brampton Flight Centre (BFC) celebrated its 70th anniversary in 2016, and is recognized as one of Canada’s top-flight training schools. Owned and operated by the membership-based Brampton Flying Club, BFC is located close to Toronto’s Pearson International Airport – Canada’s busiest – and offers students a variety of airspace classifications, experiencing both controlled and uncontrolled environments. BFC is also the only flying club in Canada to own an airport. This offers students many advantages, including quick access to the student pilot practice area, providing ample opportunity for training. Its winning record in the Webster Memorial Competition exemplifies the excellence of BFC’s training for top amateur pilot in Canada. BFC has produced the winner for three consecutive years. Equipment: BFC operates a fleet of 22 aircraft including Cessna 152s, 172s and Piper Seneca multi-engine trainers. Central North Airways Limited | North Bay and Sudbury, Ont. Central North Airways provides flight training and ground school at three locations in Ontario’s north: Coniston (20 minutes from downtown Sudbury), North Bay and the Greater Sudbury Airport. This enables Central North to offer greater flexibility in meeting its students diverse needs. The private aerodrome in Coniston is an ideal location for flight training. Situated just outside the Greater Sudbury Airport control zone so students do not have to waste precious flying time waiting for aircraft traffic or flying to the practice area. Coniston’s short runways can be difficult, so students complete their licences with the ability to handle almost any take-off or landing conditions. Operations are transferred to the Greater Sudbury Airport during winter months. The flight school also frequently flies from the Coniston aerodrome to the Sudbury airport year-round for practice on longer runways or when busier airspace will be beneficial to students. Diamond Flight Centre | London, Ont. The Diamond family of aircraft are easy to learn to fly, have an excellent safety record in the industry and utilize the latest technology for students to get the most out of their training. The Diamond Flight Centre (DFC) in London is part of a network of Diamond flight training schools in North America and provides high-quality flight training using Diamond aircraft and Diamond-specific flight training simulators. DFC is located at the London International Airport. The airport is busy enough that students acquire experience with traffic, yet is generally quiet enough so that students can practice in a relaxed atmosphere without long waits for clearance. Equipment: Diamond C1, DA40 and DA42 aircraft. Advanced simulator training is also available. Essential Helicopters | North Bay, Ont. Essential Helicopters is a leader in helicopter charters and flight training. Essential has developed an efficient model for providing all levels of service and specialization within the helicopter industry. The school’s flight training and ground school are designed to provide graduates with the skills, knowledge and attitude necessary to operate helicopters efficiently and safely under various flight conditions and remote geographic locations. Students will be involved in the multiple daily tasks plus all other aspects pertaining to the duties of a pilot, as well as benefiting from the highest level of training delivered by qualified and experienced instructors who have accumulated thousands of flying hours all across Canada. Expect to also participate in strenuous physical activities such as helicopter log pad construction, chain saw operation, underwater egress training, winter survival program and winter helicopter operations. Essential Helicopters is also aligned with the Canadore College Commercial Helicopter Pilot Licence and Pilot Preparedness program. Equipment: Robinson R22, R44 and Bell 206 JetRanger turbine helicopters. Great Lakes Helicopter | Waterloo, Ont. Great Lakes Helicopter offers both helicopter flight training and charters. The operation is based at the Region of Waterloo International Airport, one of the best training airports in Canada. The region offers a unique blend of modern, energetic urban centres and scenic, rural landscapes creating diverse experiences for helicopter flight training. Great Lakes offers 3P – a pilot proficiency program – that is the first program of its kind in Canada. 3P is for pilots possessing a valid Private Pilot licence or better, to further advance competence and skillfulness of the fundamentals of helicopter flight deriving from practice and familiarity. The training school also has a partnership with Conestoga College to provide a two-year Commercial Helicopter Pilot General Art and Science diploma program. Equipment: Robinson R22, R44 and Bell 206 JetRanger turbine helicopter. National Helicopters | Bolton, Ont. National Helicopters is a full-time private career college and one of Canada’s premier helicopter flight training schools. Located just north of Toronto, National has trained and employed commercial helicopters students, including flying for its extensive tourist operation to Niagara Falls. National’s training program guarantees top-level education with both structured classroom and individual sessions. Students will obtain the necessary guidance and education to ensure preparedness for both written and flight exams. National’s operation – including a large staff and training aircraft – with onsite flight test examinations, ensures maximum availability to each student. Equipment: Primary training is conducted on a fleet of Robinson R22 helicopters. A Bell 206 JetRanger is used for turbine training. Ottawa Flight College | Ottawa, Ont. The Ottawa Flying Club, operating as the Ottawa Flight College (OFC), has been training pilots since 1928, and is Canada’s oldest flight training college. OFC offers a diverse number of professional pilot training programs aimed at preparing pilots to fly for the airlines. The school also provides float and instructor ratings, and supports a large number of recreational pilots who fly for fun. OFC provides a unique training environment. Located at Ottawa International Airport, students learn to interact with a control tower and operate in an airport control zone as part of their training. The school’s practice area is minutes away from the airport. Training programs are flexible and can be tailored to a student’s schedule and skill levels. Students who wish to achieve a diploma along with their flight training can enrol in the Algonquin College Aviation Management program. Equipment: Eight Cessna 150s, five 172s and a Beechcraft Duchess BE-76 multi-engine aircraft. Advanced simulator training is also available. Spectrum Airways | Burlington, Ont. Spectrum Airways has been teaching students how to fly for more than 40 years, and has a multitude of training programs. The training facility is at the heart of Burlington Executive Airport, one of the busiest airparks in Ontario. Burlington Executive Airport averages 30 flights on weekdays and many more on weekends. The facility has become an exciting centre for general aviation enthusiasts. Spectrum also offers advanced training, including glass cockpit procedures. Equipment: A fleet of 18 aircraft; Cessna 152s, 172s, 172SP featuring a Garmin G1000 glass cockpit, Piper Warrior, Super Cub and Seneca multi-engine aircraft. Advanced simulator training is also available. Toronto Airways/Canadian Flight Academy | Oshawa, Ont. Toronto Airways has moved out of Buttonville Airport. Toronto Airways and its sister flight school, the Canadian Flight Academy, have consolidated operations out of the Oshawa Executive Airport. The combined operation is one of Canada’s largest flight schools, and offers eight distinct aviation-training programs from learning to fly for fun to launching a pilot career with a professional pilot program. The flight school also offers a number of shorter-term programs. Oshawa is a busy regional airport that handles flight training, air ambulance, passenger charter services, freight services and aerial police operations. The Canadian Flight Academy is currently renovating its hangar as part of a $7 million expansion program. Equipment: A fleet of 45 aircraft made up of Cessna 172s (including one with a Garmin G1000 glass cockpit, Piper Archer II, Warrior II and Seminole multi-engine airplane. Advanced simulator training is available. Waterloo Wellington Flight Centre | Waterloo, Ont. The Waterloo Wellington Flight Centre (WWFC) has been in the business of training pilots since 1932. Located at the Regional of Waterloo International Airport, WWFC is one of Canada’s five largest flight schools. WWFC maintains its own aircraft, and the centre’s new facility offers plenty of classroom space, instruction aids and briefing/study areas. The Waterloo International Airport is a controlled facility surrounded by airspace that supports a variety of flying experiences. 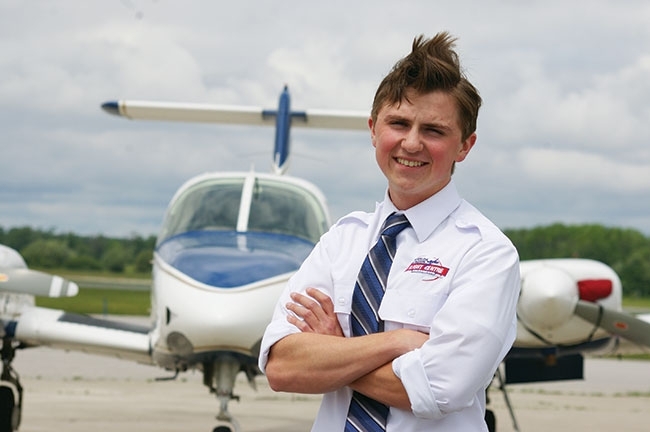 For undecided students who would like to first experience piloting an aircraft, WWFC offers a special “test the skies,” 30-minute introductory flight in a Cessna 152 or 172 with one of the school’s qualified instructors. WWFC also offers an unmanned aerial vehicle (UAV) course. This course is designed to introduce people to the range of scope of the two categories of UAV’s (under two kilograms from two to 25 kg.). It will provide participants with sufficient knowledge and resources to operate safely and comply with Transport Canada requirements. The flight centre has also been offering post-secondary programs for more than a decade, and is partnered with Conestoga College and the University of Waterloo. Equipment: Six Cessna 152s, 12 172s, one Diamond DA40 and two Piper Seminole multi-engine aircraft. Dorval Aviation | Montreal, Que. Dorval Aviation is the only flight training centre located at the Montreal-Trudeau International Airport, Canada’s third busiest, and at the heart of one of the country’s main aviation centres. This strategic location provides all experiences required for successful training within controlled airspace. Dorval offers bilingual services and a complete selection of courses from a simple introduction to aviation to a commercial pilot licence. Specialized recurrent training is also provided. Seaplane instruction is also available during the summer months. Students also have the opportunity to build up real operational experience through the schools Internship program. Equipment: Cessna 172, 172 float and Piper Navajo multi-engine aircraft. Laurentide Aviation | Greater Montreal Area, Que. Laurentide Aviation is a family business that has been providing professional flight training for 70 years. Based at Les Cedres Aerodrome, approximately 25 kilometres west of Montreal, Laurentide offers bilingual inflight and ground school instruction to suit any style of learning. The flight school is located at an uncontrolled airport, allowing students to get in the air and into the practice area quickly, reducing the cost and amount of time spent on the ground taxiing and waiting for clearance at busy controlled airports. Laurentide is located close to two major Canadian airports, including Montreal-Trudeau to ensure that students receive experience in controlled air space. The large classroom provides an excellent learning environment, including hands on teaching aids and visuals. Equipment: Cessna 152s, a 172 and a Grumman GA-7 Cougar. Debert Flight Centre | Truro, N.S. Debert Flight Centre, part of the Truro Flying Club (TFC), operates out of one of the best facilities in Atlantic Canada for flight training. Students learn in uncontrolled airspace that is not crowded with commercial jets and other air traffic. Debert is a compact airport offering students less than five minutes from flight to the training areas. Ground school is held at Debert Airport and Halifax. Equipment: Cessna 152, 172s. Simulator instruction is also available. GFT Aerospace | Gander, N.L. GFT Aerospace has been offering elite flight training in Canada since 1992, and prepares pilots for the real work of aviation from its state-of-the-art training facility. Located in Gander, N.L., GFT proves to be beneficial because students experience real world weather conditions. GFT’s sister company, EVAS Air, is a local airline for Air Canada. Because of this, GTF has established its Career Progression program, which is open to all students at no additional cost. The program provides students with the opportunity to advance directly into an airline position without ever leaving GTF. Several pilots with Air Canada and Air Canada Jazz provide advanced instruction and conduct flight tests at GFT Aerospace College. The experience and expertise of these active industry pilots provide students with exposure to the airline industry, while motivating them toward success. Equipment: Three Cessna 150s, nine Cessna 152s, four Cessna 172s (including one with a Garmin G1000 glass cockpit) and one Piper Seminole multi-engine aircraft. Simulator instruction is also available. CUI is the only organization of its type in Canada that offers a 2.5 day unmanned air ground school course for civil and commercial operators. This course is compliant with training requirements set out by Transport Canada for operators of small UAVs under 25 kg. in weight for visual line of sight operations. This course is based on the proven Canadian Centre for Unmanned Vehicle Systems (CCUVS) ground school with more than eight years of serving the Canadian UAS industry. The course focuses on aviation themed instruction, including aerodynamics, air law and regulations, communications, weather and Basic UAS 101, with regular industry updates. Students receive instruction for an Industry Canada Restricted Radio Operators Licence, which will allow them to operate and monitor aviation band frequencies. CQFA Aviation Industry Training | Montreal, Que. The course covers all phases of a drone mission within the framework of a commercial or public safety operation. All the theory necessary for the operation of a light drone for the purpose of a commercial or public security flight is presented and learned prior to practical flight. The hours of supervised practice are followed by solo flying hours and culminate into a practical flight test.